The Historic Half offers tools to chart a runner's progress along the 13.1 mile course through a tweet, over email, in a Facebook post or by text. Sign up to receive updates for one or multiple runners through the Historic Half App or online. Runners...share progress every 5K of the Historic Half course by automatically posting timing updates on Facebook timelime or over a personal Twitter feed. Chose to receive text messages while running with personal timing updates or those of running buddies. Supporters...follow a runner's progress and sign up to receive updates for one or multiple runners. The timing data may be delivered by text or email or posted on personal Facebook and/or Twitter pages. The Historic Half App will be available soon for both iPhone and Android platforms. The app offers easy access to all essential Historic Half Weekend information including maps, spectator tips, schedules, transportation, weather forecast, runner tracking service, social media feeds and live results. Motigo will transform the Historic Half into a personalized running experience! Download the Motigo App listen to it during the run to hear a course specific audio tour with periodic pre-recorded messages highlighting the course. Best feature - Invite friends and family to pre-record cheers! Download the app and search for the Historic Half to get started! Available for iOS and Android. Learn more at www.getmotigo.com. 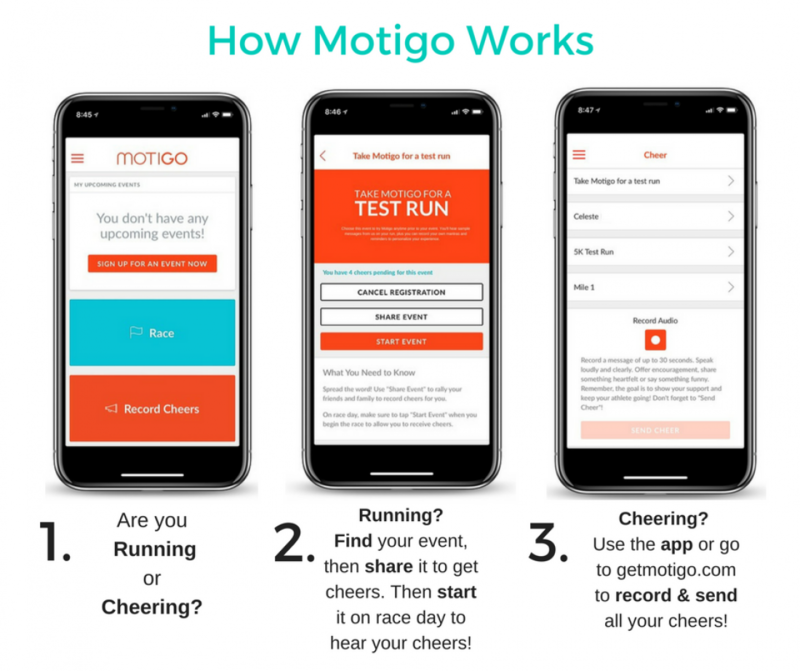 Runners, download the Motigo App and sign up for a free account. Then, allow Motigo to access your location so messages will play at proper mileage points along the course. Select the "Historic Half" and then share your own personal link for the event with family and friends to pre-record cheers that will play during the Half. Before the run, open Motigo then click “Start Event” -make sure cellular and GPS is enabled for Motigo. Turn on any other music or other fitness apps you typically use. Motigo won't interfere with them. Start moving! The messages will come on periodically, and the audio that's playing will automatically lower in volume. Using real timing data, Map Track charts a runners progress by moving a runner-shaped icon along the Historic Half Course map. This visual tool is a great way to see how a runner or numerous runners compare to each other or fare against the leaders. The best way to connect with the Historic Half remains over social media. Join the community on Facebook and Twitter and follow behind-the-scenes on Instagram. Whether running or supporting, everyone is encouraged to tweet observations or share images throughout MCM Weekend. Tag posts with #RunWithTheMarines. Taking videos? Shooting pictures? Journaling the experience? Runners are encouraged to share their unique perspective of the MCM by posting on the MCM Facebook timeline.